This recipe actually tastes EXACLY like the real deal and super easy to make. Perfect for snacks when you have people over or when you have a craving for sweet things. Add butter, shredded coconut, vanilla sugar and cream into a bowl and mix well. Put in the fridge for about 10 min. Take out the mix and roll them into wide and "little finger" long bites (as seen in the picture). Put them on a cutting board (or something else you can freeze) and put them in the freezer for about 30 min. 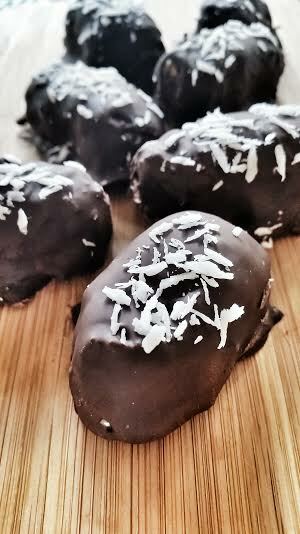 Add a little shredded coconut on top of the chocolate bites and put them back in the fridge for about 10 minutes so the chocolate can set. I absolutely love good food, and I love good desserts even more. So, why not share the love? I'm no professional, just a humble girl who love to be in the kitchen making good food and making sure our family and friends have a little extra meat on their bones. For those of you wondering why this site is in English (I'm Icelandic originally, but currently live in Sweden), it's because I'm too lazy to be writing everything in two languages.